After a collage of drinks at the Carousel Bar, it was time to retreat to the hotel before dinner. A quick shower and a fresh change of clothes later, I was on my way to GW Fins. Situated on Bienville Street and a short walk from my hotel, GW Fins bills itself as a prime seafood house and after a double dose of roast beef po-boys for lunch, I needed something a little lighter for dinner. Fresh fish seemed like the perfect solution and that’s how I decided on GW Fins. Even though it’s been nearly a decade since I last stepped into GW Fins, it doesn’t seem like much has changed. The décor was largely the same and the restaurant seemed full to capacity. After a short wait, I was at my table, and I then had a chance to look through the menu and see what sort of seafood mid-April in New Orleans had to offer. 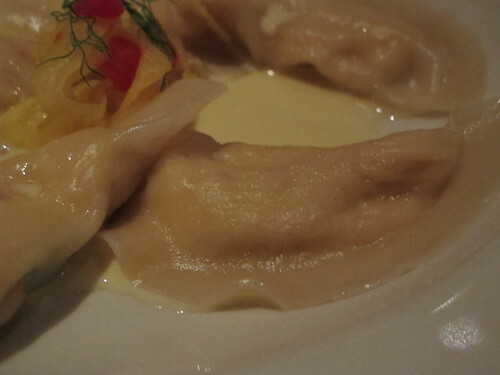 As you might expect, this meal began with a seafood appetizer and it was one of GW Fins’ most popular, the lobster dumplings. Folded in a thin wrapper and served with fennel, tomato concasse, and lobster butter, this creamy lobster filling was almost sinful. I was little worried that the creaminess of the butter sauce would overwhelm the filling but each bite was well balanced and full to the brim with a double dose of lobster flavor. In stark contrast to the delicate flavors of the lobster dumplings, the seafood gumbo featured a dark roux front and center. 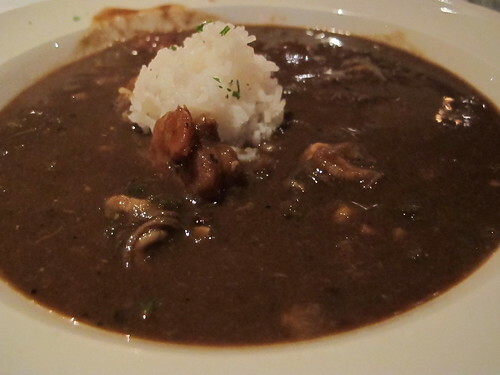 From the inky depth of the roux to the brininess of the seafood, this gumbo was simply overflowing with potent flavors. Although I could taste the crab in the gumbo, I had a hard time finding any evidence of the meat. 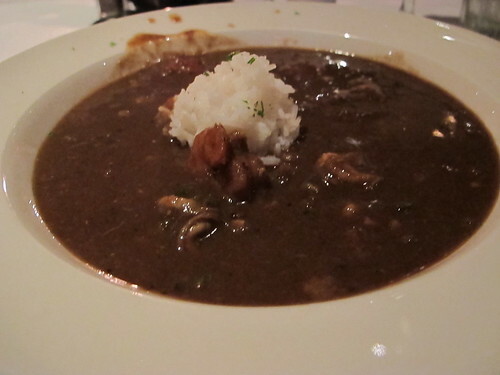 There was a smattering of sausage and a few slightly overdone oysters, but still a fine gumbo. If there was a problem with this cup, it was the season. As much as I enjoyed the dark roux, April is no time of year for this sort of dish. Maybe I’ll get the chance to revisit this gumbo in December when cooler weather will let me appreciate it more. Moving to the entrée, when I first looked at the menu, my eyes immediately fell to the Scalibut. Essentially a lobster glutton’s dream, the Scalibut is lobster risotto with Maine lobster, sugar snap peas and lobster butter. Sadly, it was sold out for the night. 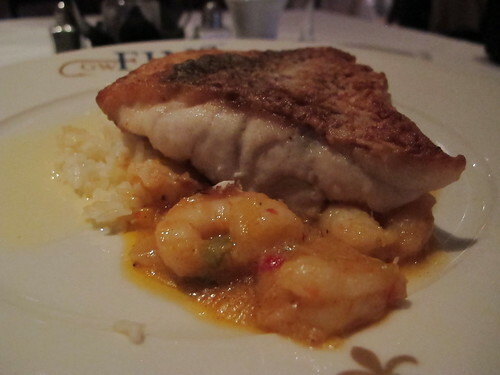 I decided to console myself with the other entrée with lobster butter, the sautéed American Red Snapper. 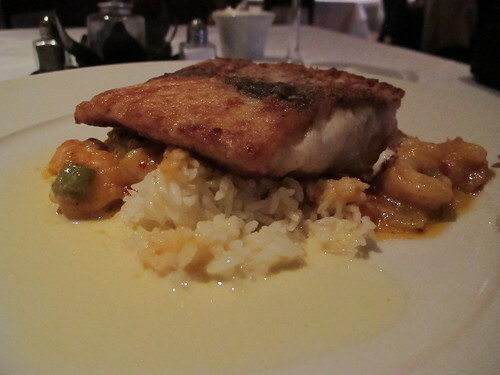 Boasting a golden brown skin and served on top of shrimp étouffee, Louisiana jasmine rice, and lobster butter, this red snapper had great promise. Starting with the jambalaya, this was Creole richness. Each forkful was brimming with well-cooked shrimp and a silky, buttery sauce. Interestingly, when taken separately the components of this dish fell flat. The jambalaya was too rich to really enjoy and the snapper, despite its rich hues, was fairly insipid and a bit overcooked. However, when the elements of this dish were allowed to harmonize, it was almost magical. The redfish was almost a blank canvas for the flavors of the jambalaya and what had been an underwhelming catch was suddenly a vibrant piece of tender white fish. 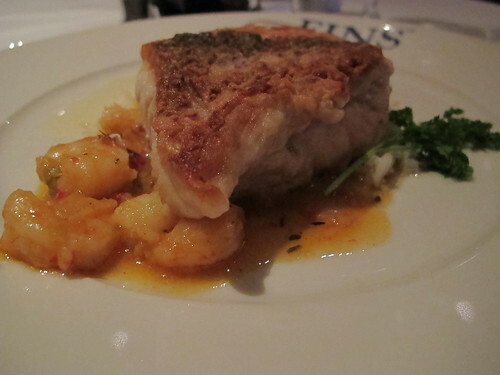 If GW Fins set out to bill themselves as a prime seafood house, they succeeded. 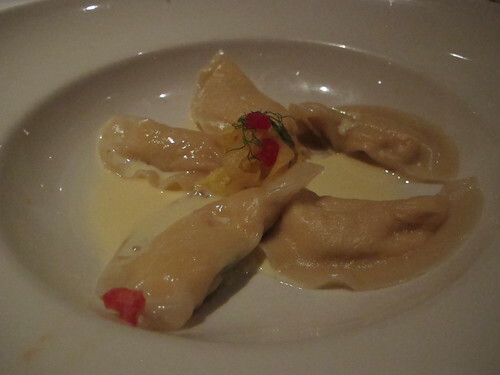 Even though I barely scratched the surface of the menu, each dish was well-crafted and exceedingly rich. Like many meals at prime steak houses, this dinner at GW Fins was more about enjoying top quality cuts than anything resembling moderation. 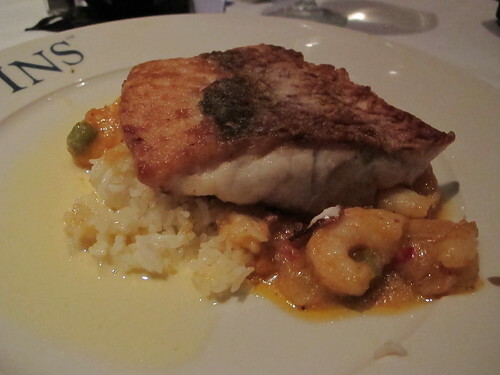 As I left Bienville Street, full of seafood and wine, I realized that my plans of a light, seafood dinner had been cast aside, but dinner at GW Fins was worth the pain.